Boom! Crash! 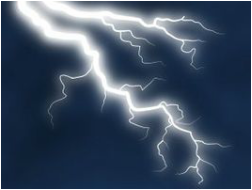 How to Make Lightning! Can you simulate lighting by creating static electricity using common household items? We think that if you rub a balloon or Styrofoam plate on your hair and then place the tin foil part of a spatula on the balloon or plate and then touch the tin foil with a gloved hand, a spark or "lightning" will occur because we will have created static electricity. Fold tin foil around your plastic fork so that it looks like a big spatula. Make sure it's as flat as possible with no sharp corners. Put on the rubber glove and use your gloved hand to rub the Styrofoam plate or rubber balloon on your hair or wool. 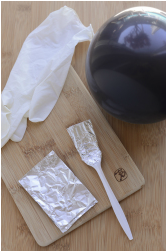 Place the plate or balloon on your cutting board, and use the gloved hand to pick up your tin foil spatula. Place the tin foil part of your spatula on the balloon or plate. Touch the foil with your other hand. What happened? How can you explain what you saw? Pull the spatula up form the balloon or plate, and touch it again. What happened this time? Did you expect that? A darker area to perform this experiment would be great if possible. You should have seen and felt a spark when you touched the foil. When you lifted the foil off and touched it again, you should have felt another spark. Your hand doesn't spark, and most non-metallic objects won't spark when you touch the charged object either. All metals insulated by your glove that touch both your charged object and your hand will spark. When rubbing a balloon or plate on your hair or wool you are moving electrons. When you move electrons, you give an object a net charge. Metals are special materials called conductors. Your balloon and plate are called insulators because they do not allow electrons to move where they want. When the tin foil spatula (conductor) comes near the balloon or plate (insulators) the electrons want to either get close to or far away from the object and create a spark (lightning). Owen lives in Somers, NY with his parents, 2 older brothers and his dog, Zoe. He loves attending SIS finishing up his last year there in 5th grade with his incredible teacher, Mrs King. Owen's interest include soccer and basketball and spending time with his friends. A fifth grader at Somers Intermediate School. Crazy about his teacher, Mrs. Luke. She is awesome and fun. Favorite subject is Math. Michael loves sports, especially Soccer, Baseball and Lacrosse. Favorite team is the NY Yankees. Favorite Athlete is Derek Jeter. Michael is also a Black Belt in Tae Kwon Do, likes to ski, watch movies and hang out with his family.